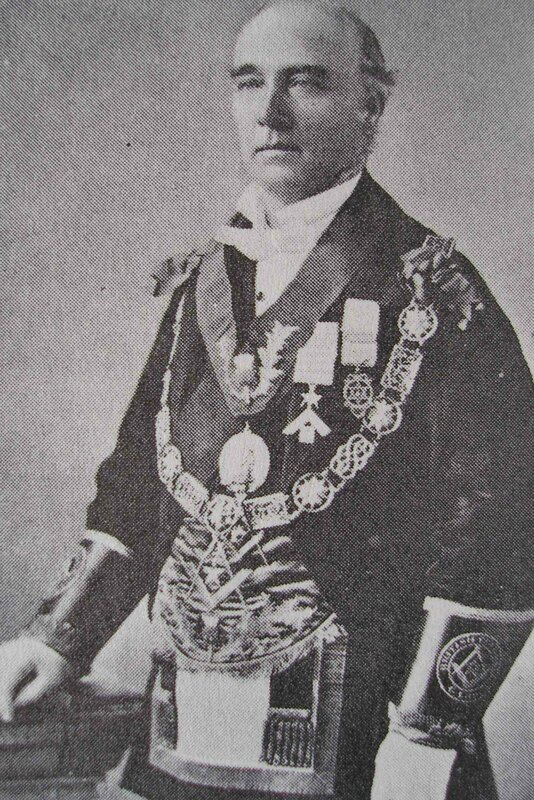 Eli Harrison Sr. – Past Grand Master (died 1907, aged 84) – Temple Lodge, No.33, Duncan, B.C. As part of our Vancouver Island Masonic History Project series on Vancouver Island Cemeteries – Masonic Interments here is a page on Eli Harrison Sr., Past Grand Master, who is buried in Ross Bay Cemetery, Victoria, B.C. His son Eli Harrison Jr. is buried in the same plot but the grave is currently unmarked; the original gravestone has disappeared in the intervening years and nobody knows what happened to it. Eli Harrison Sr. as Grand Master of B.C, circa 1878-81. Eli Harrison Sr. was a member of Vancouver & Quadra Lodge, No. 2 in Victoria, B.C. He served as Grand Master of B.C. from 1878-81. His son, Eli Harrison Jr. (1852-1930), was also a member of Vancouver & Quadra Lodge, No.2. 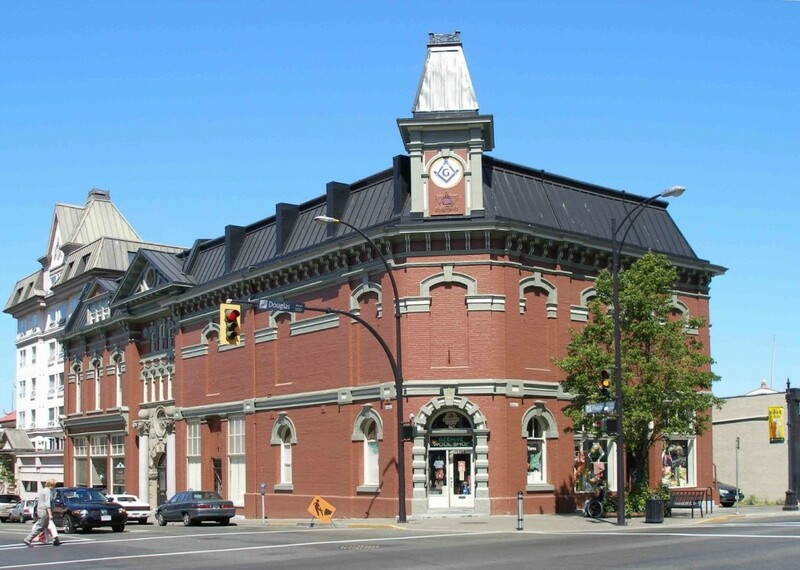 As Grand Master, Eli Harrison laid the cornerstone of the Victoria Masonic Temple in 1878. Victoria Masonic Temple, 650 Fisgard Street. Built in 1878 with additions in 1909, Eli Harrison laid the cornerstone of this building. “HARRISON – At St. Joseph’s hospital, on Thursday afternoon, the 19th inst., Eli Harrison, J.P., the beloved husband of Elizabeth Harrison, in the eighty-fourth year of his age. Deceased was a native of Hurdsfield, Cheshire, England. The funeral will take place from the Masonic Temple on Monday, the 23rd inst., a 2 o’clock p.m., and from Christ Church cathedral at 2.45 p.m.
“The death occurred yesterday afternoon at saint Joseph’s Hospital, of Eli Harrison, of 43 Cadboro Bay road, father of Judge Harrison of the county court, after a brief illness. The late Mr. Harrison occupied an important place in the early life of this city. Born in Hurdsfield, Cheshire, England, 84 years ago he came to America in 1850. Two years later he crossed the Mississippi valley across the mountains and then unknown plains to California. The journey was made by wagon, the one party traveling alone through a good deal of the journey. En route he was present at the storming of Fort Bridger. During his residence in San Francisco he took part with the other English and French inhabitants in celebrating the victory of the allied forces in the Crimea. While doing so they were attacked by the mob who sympathized with the Russians but they fought them off and continued with the celebration. In the days of the Cariboo gold rush in 1858, the late Mr. Harrison came north to Victoria and since that time had made his residence here. At the time of the union of the provinces he was chosen as one of the deputation to interview Lord Dufferin, then governor-general of Canada, with respect to the non-fulfillment of the terms of union. For a number of years he justice of the peace of the city. Always a prominent mason, the late Mr. Harrison was elected grand master for the province from 1878 to and including part of 1881. He was the first principal of the Columbia Royal arch, chapel number 120 and was for some time special deputy of the Ancient and Accepted Scottish Rite, besides being an honorary member of several other masonic bodies. In 1878 he laid the foundation of the Masonic temple in this city, officiated at its dedication, and for many years was one of its trustees. The immediate survivors of his family are: His wife, Mrs. E. Harrison, Judge E. Harrison, Mrs. D. McPhaden, New Westminster; Mrs. J.D. Batchelor, of Honolulu; Alfred Harrison, Portland, Ore.; Mrs. A.F. Gillihan, Berkeley, Cal. ; Mrs. F.H. Wollaston, and Mrs. R. Ford Verrinder, of Victoria. Eli Harrison Sr. is buried in Ross Bay Cemetery but his headstone has disappeared. His son, Eli Harrison Jr., is buried in the same plot.